Back cover blurb: A long-lost friend is a stranger you think you know. Eden was its name. "An alternative school for happy children," said the brochure. "A load of hippies running wild in the woods," said the locals. After a suicide it closed its doors and the children scattered. Thirty years later, it's a care home; its grounds neglected and overgrown, its only neighbour Gloria Harkness, who acts as tenant/caretaker in a rundown farmhouse to be close to her son. Nicky lives in the home, lighting up Gloria's life and breaking her heart every day. Nicky and a ragbag of animals aren't enough to keep loneliness at bay, and when Gloria's childhood friend and secret sweetheart, Stephen "Stig" Tarrant, turns up at her door one night, all she can see is the boy she knew. She lets him in. Stig's being stalked by an Eden girl, he says. She has goaded him into meeting her at the site of the suicide. Except that suddenly, after all these years, the dead are beginning to speak and suicide is not what they say. When the children of Eden were sent out into the world they took a secret with them. And someone is making sure they take it to the grave. 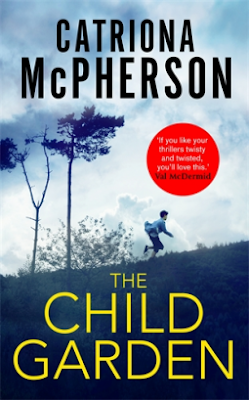 The Child Garden is the first of Catriona McPherson's novels that has caught my attention. It is a mysterious novel, full of intrigue, with some added superstition and folklore to make it a little more creepy. Gloria Harkness is disturbed by recent events in her life, so when an old school friend Stephen 'Stig' Tarrant turns up at her door desperate for help claiming he's being stalked, she can't help but let him in to her house. Soon she discovers that his 'stalker' has been murdered and Stig is the prime suspect. But all is not as it seems involving those who uses to go to the infamous 'Eden' School, and soon Gloria realises that Stig's stalker is not the one face from their past who is recently deceased. Before she decides to delve deeper, Gloria must decide if she can truly trust Stig, because once they start digging around in the past, there is no turning back, and theirs may not be the only lives in danger. The Child Garden is an intriguing and enjoyable novel with lots of twists and creepy bits to keep even the most sceptical of readers hooked until the very end. The Child Garden is available now via Amazon online and all good book shops.